Roger McGuinn offers a short course in ‘Mr. Tambourine Man’ on Woodsongs Old-Time Radio Hour. 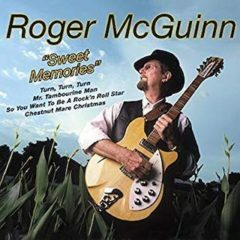 McGuinn recorded a new version of the Byrds’ first hit on Sweet Memories. 2. 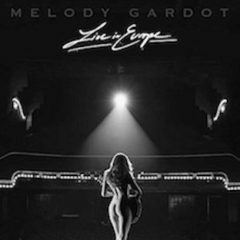 LIVE IN EUROPE, Melody Gardot (Verve)– Melody Gardot’s hallmark is intimacy and storytelling. Stylistically, she fuses the raw, febrile emotion of Parisian chanteuse Edith Piaf with the cool coquettish artifice of Peggy Lee and comes up with a unique sound defined by a hushed, torch-song-like delivery complete with a tremulous vibrato. Her approach is often decidedly low key but it’s also high on emotion. Over the course of four studio albums for Decca Records–Worrisome Heart (2008), My One & Only Thrill (2009), The Absence (2012) and Currency Of Man (2015), where she explored jazz, blues, world music, soul and gospel, the latter two albums being highly conceptual affairs springing from her world travels–Ms. Gardot has carved a unique niche for herself as a singer and performer. And she’s scored some hit singles along the way (“Worrisome Heart,” “Who Will Comfort Me,” “Baby I’m A Fool”) and also accrued a big fan base in Europe, where’s she’s racked up several Gold and Platinum albums. It perhaps fitting, then, given the acclaim she’s enjoyed on the continent, that her latest opus presents a clutch of self-curated songs recorded on tour there between the years 2012 to 2016, in locations ranging from Barcelona and Lisbon to Paris, Utrecht, Amsterdam and London. 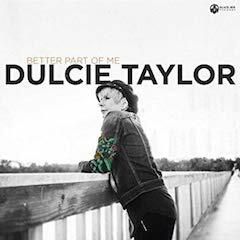 This is not the first time the Philadelphia-raised singer has released live recordings–two EPs, Live In Soho (2009) and Live In Paris (2010), are in her catalogue–but Live In Europe, a double-CD and triple-LP collection comprising 17 tracks, is her first full live album. 3. SOUL DON’T WORRY! 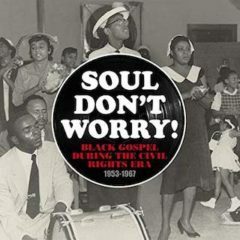 BLACK GOSPEL DURING THE CIVIL RIGHTS ERA, 1953-1967, Various Artists (Narrowly Records)— Soul Don’t Worry is the most ambitious project to date for NarroWay/Gospel Friend, the Sweden-based gospel reissue operation headed by producer Per Notini. In the past, Notini has focused on chronicling individual artists and labels, but this time his focus is on an entire era’s worth of gospel music. And not just any era, but one of the most significant of the 20th Century: the fight for civil rights in America. Some listeners might read the subtitle and assume that all 47 tracks of this two-CD set are socially significant. The keyword in the subtitle is “During.” While all of the songs contained in this collection were recorded during the Civil Rights Era, not all specifically reference the Civil Rights Movement or specific events during that time. Nevertheless, because it is part of the producer’s intent to demonstrate the power of song in an era of protest, selections with overt political references naturally populate this project. 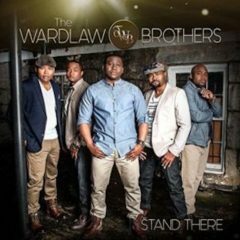 They include the Friendly Four’s “What is Freedom,” a single snatched from obscurity by Baylor University professor Robert Darden’s work chronicling gospel songs with explicit messages. Songs about the 1963 assassination of President John F. Kennedy are rendered by Little Junior & the Butler-Aires (“Jackie, Don’t You Weep”), Evangelist Rosie Wallace (“Take Courage”), and the Trumpets of Joy of Cincinnati, Ohio (“The News that Shook the Nation”). “Shout School Children” by Brother Will Hairston of Detroit, arguably the most prolific black balladeer of the 1950s to spotlight social injustice, is about Southern pushback following the U.S. Supreme Court’s 1954 mandate to integrate public schools in Brown v. Board of Education. He even namechecks Autherine Lucy and her effort to gain admission to the University of Alabama. 5. 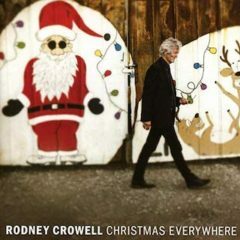 CHRISTMAS EVERYWHERE, Rodney Crowell (New West Records)— Not quite achieving Scrooge-level disdain for the Christmas season but neither marveling at silver bells and Santa Claus comin’ to town, Rodney Crowell delivered a decidedly different kind of Yuletide album in 2018, with a bit more of a jaundiced view of the season than is typical of Christmas fare but nonetheless refreshing, if only in justified irreverence. On his website, Crowell explained the genesis and evolution of Christmas Everywhere, and so, as a public service to our readers, we offer this excerpt, in the artist’s own words, as posted on his website. 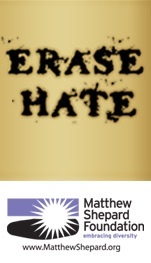 For the full explanatory essay, follow this link; for the abridged version, read on. In early 2015, I was touring Great Britain as a member of the Transatlantic Sessions when the notion of writing an album’s worth of original Christmas songs began to creep back into my creative process. However, nearly a year passed before I hit on the idea of writing a song referencing one of those tacky, artificial Christmas trees with the tri-colored light wheel that seemed to flood the market in the early Sixties. In the process of composing “Merry Christmas From an Empty Bed,” I sent what I had to Brennan Leigh, then living in Austin,, and asked if she’d write a verse. I was delighted with what she sent back. 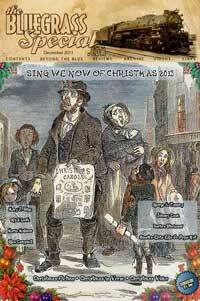 The Christmas record, I realized, was beginning to take shape. Sometime around Christmas 2016 I came home to find my granddaughters, Addie and Iris—ages 10 and eight, respectively—sitting side-by-side and playing on our old upright piano a melody that to my ear sounded like something from the early 19th century. I asked what song they were playing and in unison they replied, “Something we just made up.” I hit Record on my iPhone and requested they play it again. Using their melody almost entirely, I spent a couple of months composing the words to “Come Christmas.” A generation had passed since I first made up a Christmas song with their mother. Sometime later, in rapid succession, I came up with “Christmas in New York,” “When the Fat Guy Tries the Chimney On For Size,” “Christmas For the Blues” and, again with Mary Karr, “Let’s Skip Christmas This Year.” With those tunes in the bag, I began entertaining the rather vague idea of writing something that Spike Jones might have recorded in his heyday. The lyrical ideas for “Christmas Everywhere,” came fast, as did the realization that if I were ever going to realize the song’s compositional possibilities, I would need help from the premier Gypsy Jazz guitarist and composer, John Jorgenson. John and his wife, Dixie, are close friends of mine and Claudia’s and one night after dinner, John and I slipped off to another wing of their house and pulled the complete song together—including the dream sequence in which a child asks Santa for a time machine in which to go back and prevent John Lennon’s murder. I was finally ready to record an album of original Christmas songs. With Dan Knobler producing and some very gifted musicians and vocalists lending their talents, the making of Christmas Everywhere rank with the most enjoyable recording sessions I’ve ever experienced. The record was close to being finished when it occurred to me that to set the tone for the album’s mostly irreverent subtext, I needed to compose a lyrical prelude. In honor of Clement Moore, who wrote the poem we all know as “The Night Before Christmas,” I came up with a short piece called “Clement’s Lament (We’ll See You in The Mall).” Tania Hancheroff and Kim Keyes stopped by the studio and performed the tune with Jordan Lehning’s orchestral backing and the album was pronounced complete. 6. 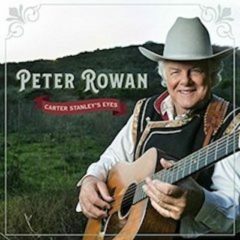 CARTER STANLEY’S EYES, Peter Rowan(Rebel)– If any artist belongs in Deep Roots, it’s Peter Rowan. For the past few years Rowan has been on one powerful journey exploring his deepest roots, and on Carter Stanley’s Eyes he stays the course, as stirring as ever. This new album follows the 2017 surprise he gave us with My Aloha!, in which he explored the links between traditional Hawaiian music and bluegrass. Immediately preceding that album, his challenging Dharma Blues—part of a triptych of albums revelatory of what I declared to be an “intensely interior, deeply personal journey” producing the most personal songs of his storied career. (Dharma Blues was a Deep Roots Album of the Year in 2014.) 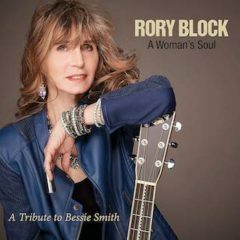 Naturally, those songs were mostly bluegrass, but there were also tips of the hat to Rowan’s folk, progressive bluegrass and country-rock roots along the way. 8. 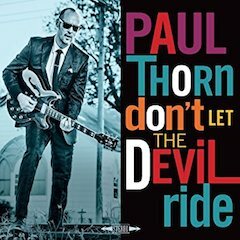 DON’T LET THE DEVIL RIDE, Paul Thorn (Perpetual Obscurity Records)– Paul Thorn’s Don’t Let the Devil Ride hits the Americana music jackpot bit time. With guest vocalists on the order of the Blind Boys of Alabama and the McCrary Sisters, and the Preservation Hall Horns among the musicians, and having recorded it all down south (in Muscle Shoals, at Rick Hall’s Fame studio; in Memphis at Sam Phillips’ studios; and in New Orleans at Preservation Hall, Thorn could have performed “Happy Birthday to You” and it would have sounded smothered in tangy BBQ sauce. 11. SETTLING SCORES VOL. 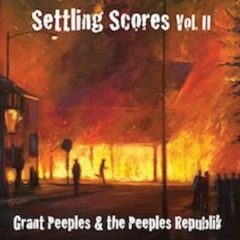 II, Grant Peeples & the Peeples Republik (Gatorbone)— You would think this day and age would generate far more protest music than it has. Which is not to suggest that this gem of an album—the fourth Peeples release to be produced by Gurf Morlix (a credit that in and of itself ought to get your attention) —is all Sturn und Drang, although Peeples’ music does have much in common with that 18th Century German literary movement. This holds true for both his outrage at the disturbing state of our Republic in the Trump era and for the depth of Peeples’ romantic sensibility. So on the one hand you get “This Could Be a Long Night,” a cool, bluesy, quite wry manifesto warning of our social contract being shredded on a daily basis (“everything you ever cared about/everything you thought you’d never doubt/all of this could be driven out/and it could be a long night…”), but on the other you get a spare, lovely cover of Steve Earle’s “Goodbye,” featuring a tender supporting vocal by Jaimee Harris, as well as an equally touching lover’s ode, “Llliana,” an update of one of Peeples’ earliest songs replete with the plainspoken poetry and detailed images common to Tom Waits’s most affecting tunes in this spoken-sung style (it also benefits atmospherically from a subtle, nuanced violin solo by Tim Higgins). Putting the capper on this impressive effort is the artist’s revision of Dylan’s near-13-minute “Brownsville Girl” (which itself began life as a Dylan-Sam Shepard co-write, “New Danville Girl,” which itself borrowed from Woody Guthrie’s “Danville Girl”), which Peeples’ has, as he writes in the liner notes (must reading if you want to understand the twisted, tangled roots of Dylan’s song), “boiled out of it (and injected into it) my own story.” This too, much like the other socially conscious numbers here, is not altogether despairing—remember, in the sentiment “it could be a long night,” the modal verb “could” carries with it the possibility of change for good as well as for ill, depending on the roll of the dice. Sounding like the mutant son of Billy Joe Shaver and Guy Clark, Grant Peeples is an artist with something to say, and he’s saying it in not as a polemicist, but rather as a poet. Attention must be paid. –-David McGee Follow this link to Grant Peeples’ website for more information and tour dates. 12. 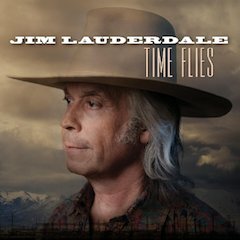 TIME FLIES, Jim Lauderdale (Yep Rock)– Jim Lauderdale is a steady geyser of Americana, releasing over two dozen solo albums and collaborations and writing for and with many mostly country musicians–from George Strait to Rodney Crowell, from the Dixie Chicks to George Jones–at a steaming pace. He shows up in so many places as a solo artist and as a songwriter that you wonder when he has time to sleep. Being prolific, however, would not mean much if Lauderdale’s songwriting and singing weren’t consistently outstanding, as Time Flies demonstrates in abundance. The first half of the album explores classic and contemporary country sounds by way of the melancholy title track, the environmentally conscious “The Road Is a River,” the Willie Nelson-like “Slow As Molasses” and “When I Held the Cards,” a tear-jerker of a hard-luck story. 13. 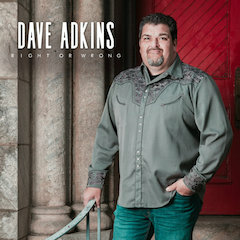 RIGHT OR WRONG, Dave Adkins (Mountain Fever Records)— Right or Wrong offers everything that has propelled Dave Adkins into contemporary bluegrass music’s hierarchy. The album kicks off in high gear with “Blue Blue Rain”—a surefire hit with fans who lean more toward the traditional side of bluegrass. Following suit are “Him and West Virginia,” “Roll Little River” and the album’s first single, “Blood Feud (Hatfields & McCoys),” a duet/co-write with Larry Cordle that reached #1 on Bluegrass Today’s Top 20 Songs chart. 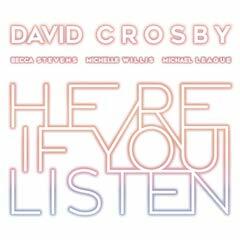 But beyond the traditional sound that Dave presents so well on this new album are some real gems that touch the heart and reveal his tender side. “Goodbye Caroline” is so melodically beautiful that you almost forget it’s a song about leaving. And “I Can Only Imagine,” a remake of the popular song first recorded by Christian rock group Mercy Me, is anything but a copy of the original. 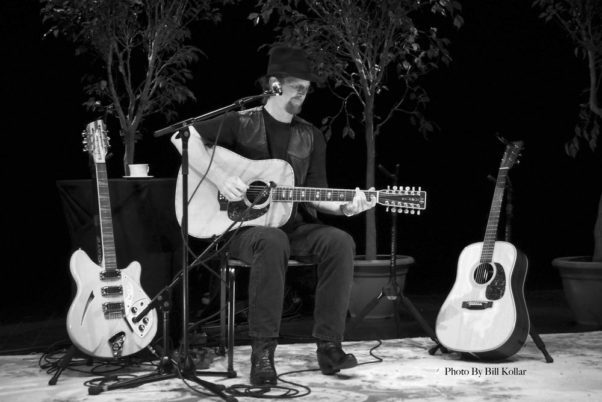 Dave effectually delivers each lyric with true believability, poignance and heart. As with all of Dave’s earlier releases, Right or Wrong showcases his craft as a songwriter, but the album also spotlights the gifted songwriting community he draws from and is part of. Jerry Salley, Eli Johnston, Blake Grisham, Greg Preece, Bart Millard, Terry Foust, Mitchell Brown, Carl Caldwell, Craig Lackey, Kenneth Johnson, Ray Bruce, Daniel Salyer, Dave Morris, and Dawn Kenney all lent their artistry to making this project as powerful as it is. 14. LUCKY HAND, Steve Dawson (Black Hen Music)– Steve Dawson’s eighth album, and his first collection of instrumental music since 2014’s Rattlesnake Cage, showcases the artist’s brilliant fingerstyle work on a variety of instruments, accompanied by special guests Jesse Zubot on violin, harmonica legend Charlie McCoy and mandolinist John Reischman, as well as the presence of a string quartet on a number of tracks. The scope of Dawson’s musical voice broadens to take on a cinematic quality, as he deploys his guitar to sketch aural paintings and create tapestries of sound. 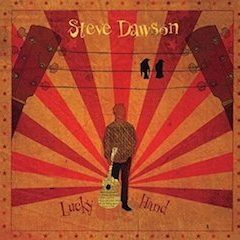 Recorded live off the floor, with up to a dozen microphones in various positions throughout the large studio space to capture the guitar and orchestration, Lucky Hand represents the ideal intersection of the primitive and the modern that has fascinated Dawson for so long. Comprisedof 10 instrumental tracks of solo, duo and full-bodied string quartet works, Lucky Hand‘s music is sweeping, dynamic and visually evocative throughout. Enlisting Jesse Zubot in the project to create complementary and adventurous arrangements for his guitar excursions, Dawson delivers completely realized compositions, enhanced by Zubot’s orchestrations adding color to the sepia-tinged melodies.. 2018 marked 20 years since Zubot and Dawson teamed up, and their collaborations remain inspired and inspiring. 15. 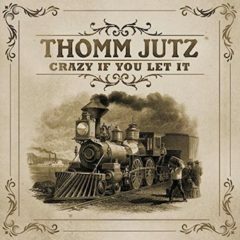 CRAZY IF YOU LET IT, Thomm Jutz (Mountain Fever Records)— To anyone who’s been paying attention to album liner notes this decade, Thomm Jutz’s name is already familiar. Jutz is a Nashville-based songwriter, producer, sideman and singer with a list of credits growing lengthier by the day, it seems. 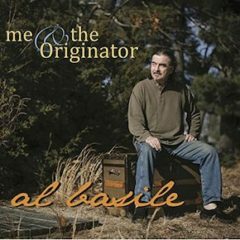 He has written numerous popular bluegrass songs (“Carolina Wind” with Irene Kelley, “Forty Acre Blues” for the Darrell Webb Band and “Walking In The Blue Ridge” for Junior Sisk), produced Nanci Griffith’s excellent The Loving Kind and with Peter Cooper, guided, wrote and produced the exceptional Mac Wiseman homage, I Sang the Song. If that wasn’t enough, the German-born Jutz also created the three-volume The 1861 Project,comprised of new songs focused on lives impacted by the Civil War. Having recorded a handful of collaborative albums, Crazy If You Let It is Jutz’s third solo release, but the first to receive widespread distribution. 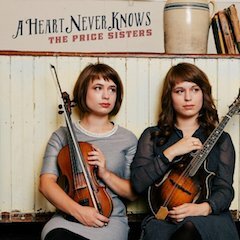 With strong roots in country and folk music sounds, this is essentially a modern bluegrass album but the truth is it defies rigid categorization. Americana, then? Ray Bonneville’s spartan lyrics evoke images of freight yards, open prairies and empty dwellings. His masterful, moody songs on At King Electric embody the spirit of the North American continent he has wandered for decades. 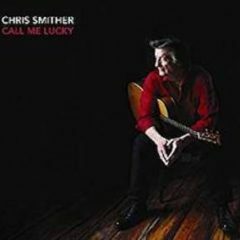 This, his ninth studio album, is a collection of bluesy folk songs whose sparing, haunting lyrics might draw comparisons to Guy Clark, at times Tom Waits and at others Johnny Cash. He also brings to mind Twangville friend Kevin Gordon (and looks like what Gordon might look like in 20 years). 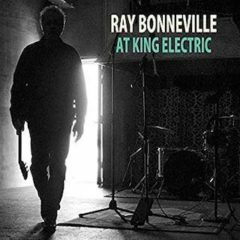 Bonneville has some really nicely written songs on At King Electric, including “Next Card to Fall,” “Codeine,” “Tender Heart,” “South of the Blues,” and “Papachulalay.” One gets the feeling there are a lot of miles behind these songs. 17. 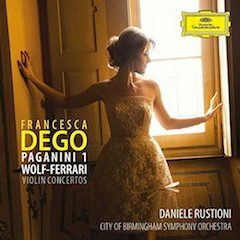 PAGANINI 1; WOLF-FERRARI VIOLIN CONCERTOS, Francesca Dego, City of Birmingham Symphony Orchestra (Daniele Rustioni, Conductor) (Deutsche Grammophon)–In a time when children are being gunned down in their schools and nations are hurtling towards war over differences of negligible consequence to the daily lives of their citizens, it feels inappropriate even to think of artistic tragedies. The sobering realities of politics and the evolution of culture are now more indivisible than ever before, however, and the struggles of art and artists are often educational on a broader level. Ironically, music as a commodity is accessible to 21st Century listeners in ways of which previous generations could hardly have dreamed, but music as a common language allowing, even encouraging, civil discussion of humanity’s troubles is understood by ever fewer artists and listeners. Counterintuitive as it may seem, joy is the critical accent now so often missing from serious musical discussions. A serendipitous peculiarity of music is that, whether the emotions it communicates are exuberant or funereal, the most effective performances are those exuding the joy of using music to connect people. Absent this elation, the most accomplished technique cannot transcend the mundane: rather than hearing music, the listener perceives notes. The musician completes a task like any other commonplace chore, and Saint Cecilia is martyred anew. Paganini: Violin Concerto No. 1 in D Major, Op. 6, MS.21-3. Allegro spiritoso, Francesca Dego and the City of Birmingham Orchestra conducted by Daniele Rustioni. From Paganini 1: Wolf-Ferrari Violin Concertos. 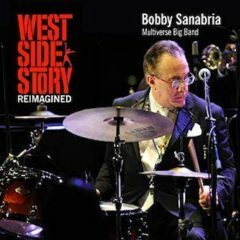 For those who thought that nothing more could be said or written about [West Side Story], drummer Bobby Sanabria and his New York-based Multiverse Big Band offer a scintillating reappraisal from a Latin perspective on its fiftieth anniversary, infusing the score with rhythms and accents that Bernstein, in spite of his vast musical knowledge, perhaps never even knew existed. These include, among others, the bomba xica, joropo, bembe, bomba yuba, samba-cancao and son montuno. As a result, Bernstein’s impressive score sounds even fresher and more lively than ever. The lovely ballad “Maria,” which opens the “Second Act” of this two-CD set, is singularly transformed, using African bembe rhythms, Nigerian/Yoruban ceremonial drums and forceful chants by Sanabria and the ensemble to underline its amorous theme. That, however, is but one example among many, as arrangers Jeremy Fletcher, Niko Siebold, Jeff Lederer, Matt Wong, Danny Rivera, Eugene Marlow, Andrew Neesley and Takao Heisho let their imaginations run free to lend the entire score a 21st century carriage and tenor. Trumpeter Neesley, baritone saxophonist Rivera and percussionist Heisho double as members of the ensemble. Fletcher’s aggressive arrangements of the “Prologue,” “Gee, Officer Krupke,” “One Hand, One Heart,” “Somewhere” and “Epilogue/Finale” are especially effective. … Indeed, everyone plays a pivotal role in bringing Sanabria’s vision to life—and that of course includes the superb Multiverse ensemble, which never misses a beat in a performance recorded live at Dizzy’s Club Coca-Cola in the Big Apple with proceeds earmarked for Puerto Rico hurricane relief. 20. 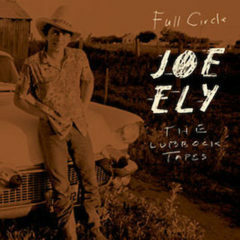 FULL CIRCLE: THE LUBBOCK TAPES, Joe Ely (Rack ‘Em Records)– When the Clash started kicking around with Joe Ely in the late ’70s, they were drawn to this West Texas wild card who didn’t like rules. Ely was a singer-songwriter from Lubbock (by way of Amarillo), which meant he fit in quite naturally with the outlaw country movement that had emerged with his Austin neighbor Willie Nelson at the forefront. But Ely was also drawn to honky tonk, rock, Tex-Mex, Cajun and Beat literature, and didn’t much think of or care about music as a business. Full Circle: The Lubbock Tapes documents the artist’s formative years as a solo act. After his one-of-a-kind band, the Flatlanders, imploded, Ely ran off and, literally, joined the circus: he took care of llamas, stallions and “the world’s smallest horse” for Ringling Brothers and Barnum & Bailey. After one of his charges kicked him and broke three ribs, he returned to Texas to recover and there began working on songs, some of them written by his old Flatlanders pal Butch Hancock. 23. 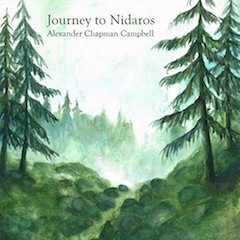 JOURNEY TO NIDAROS, Alexander Chapman Campbell (Alexander Chapman Campbell)— Journey to Nidaros presents a sequence of nine piano pieces by the young Scottish composer/pianist Alexander Chapman Campbell, issued on his own label. The music describes a journey through Norway that Chapman Campbell undertook in 2015, walking from Oslo to historic Nidaros Cathedral in Trondheim. Rather than being a reflection on a John Muir-like journey into the quietude and beauty of nature, the pieces actually were written during the journey. In an incredible turn of events, Chapman Campbell explains in his CD liner notes how he came upon pianos by accident (apparently pianos sit in the most unusual places in Norway) and began merging musical ideas as he strolled through Norwegian forests. In this short documentary, Alexander Chapman Campbell explains his 2015 walk along the ancient Norwegian pilgrimage route for Oslo to Nidaros Cathedral, a jaunt on which he intended to enjoy solitude, wilderness and time away from composition. Unexpectedly, the journey became an increasingly musical one, and a new collection of solo piano music emerged, Journey to Nidaros. 24. 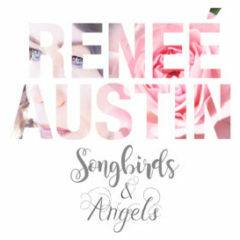 SONGBIRDS & ANGELS, Renee’ Austin (www.reneeaustin.org)– In 2005, blue-eyed blues and soul songstress Renee’ Austin was a rising star in the music business. She had signed a record deal with Blind Pig Records, shared the stage with top charting artists, and was featured in an acclaimed PBS special, Blues Divas, hosted by Morgan Freeman. Shortly thereafter, Austin found a lump in her throat and had it surgically removed. The result left her with a paralyzed left vocal cord and a diagnosis of never being able to sing again. An understandably heartbroken Austin released a tear-stained letter informing her fans of her condition being pronounced permanent, but she never stopped praying for a miracle. Lo and behold, in time she regained her speaking voice, and later received the miracle she was praying for—the return of her singing voice, “lower and with no range,” as she said. That too turned out to be a temporary condition. And here she is.